This weekend I traveled north of home with fellow author Janet Eaves to attend the Lori Foster Reader and Writer Get Together in Cincinnati. A record number of people were in attendance -- almost 300 in total, with approximately 112 authors. This was a great chance to meet readers and new friends and to network with authors and industry professionals. We met up with the other half of the SisterWriters for most of the events and the booksigning on Saturday afternoon. We also had a great time with our fellow authors from Resplendence Publishing. We laughed and sang too much and sort of pigged out on cheesecake (at least I did) but heck, these times come around all to few, right? 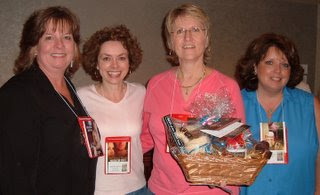 Janet, Magdalena Scott, Jan Scarbrough and I brought a gift basket for the charity raffle and were so pleased that Joyce Ann McLaughlin won it! Joyce Ann, we sure hope you enjoy your "stay" in Legend, Tennessee! And, hope you enjoy your copy of Ladies of Legend: Finding Home. Barbara Vey from Publisher's Weekly also posted Joyce's prize catch on her blog today, so check it out if you have a chance. I love Barbara's blog and visit there quite often. I'm home and dead tired but already looking forward to the next time I get together with friends. Tired, but oh, well worth it! Wow! THE CURSE is a bestseller!